-Water is the major component of the Cape Gooseberry which makes a fruit highly moisturizing with low caloric value despite being rich in sugars, mainly sucrose and less glucose and fructose. -Its also characterized as a very important source of beta carotene to be consumed they are metabolized to become vitamin A inside of our body, so it is credited with the fortification of the optic nerve and the maintenance of skin and hair. -Vitamin C is also present in this exquisite fruit, taking part in various functions essential for our body such as the formation of collagen, stimulates the absorption of food iron and favors the resistance to infections. 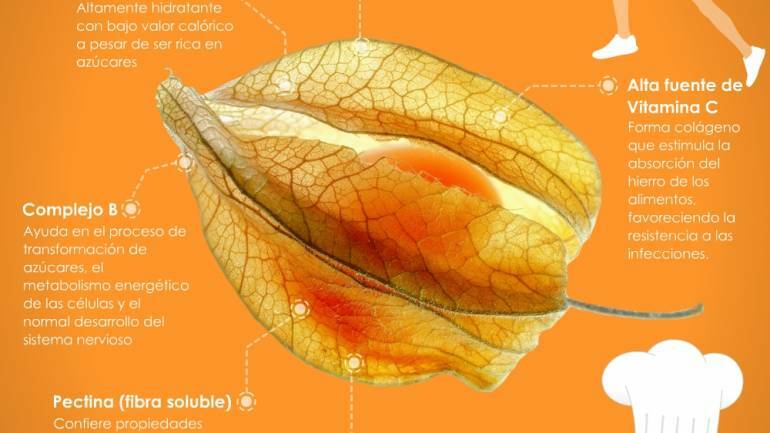 -Other vitamins present in the Cape Gooseberry are the of the complex B (thiamin, niacin and vitamin B12) to help in the transformation of sugars, the energy metabolism of the cells and very important in the growth and normal development of the nervous system. -Amount of protein and phosphorus containing it are exceptionally high for a fruit, so it also has properties forming in our body in addition to promoting the transport of power through the cells.